Health and Human Services Secretary Tom Price resigned Friday, hours after President Donald Trump told reporters that he would reach a final decision on whether or not to fire the former Georgia congressman over his use of charter flights by the end of the day. The White House announced the resignation, saying in a statement that Mr. Trump had accepted Price’s offer to step down. Wright, the current deputy assistant secretary for Health and director of the Office of Disease Prevention and Health Promotion, will take over for Price as of Friday night, the White House said. Trump had reportedly grown increasingly angry that the news about Price’s use of expensive, taxpayer-funded charter flights was distracting the public from the administration’s rollout of its tax reform plan. The president also was reportedly angry with Price for not doing more to sell the Republicans’ failed health care proposals earlier in the year. Price’s decision to resign capped a 10-day stretch of negative press about his charter flights. Politico broke the story Sept. 19, when it first reported that Price used charter flights costing thousands of dollars for official business trips. After the initial story, Politico and other news organizations reported that Price took dozens of flights on charter or military planes that were funded by taxpayers, including during a three-day swing through Europe and Asia. Earlier this week, Price announced that he had paid back $51,887 to the federal government to cover the costs of his seat on charter flights he had taken for official trips. But in the end, that appeared not to be enough to save his job. Williams confirmed that no health secretary ever has been reviewed by her office on their use of charter aircraft. She also confirmed that the inspector general will continue looking into the matter even though Price is stepping down. The resignation was a stunning turn of events for Price, who took over as health secretary earlier this year with a promise to help the Trump administration overhaul the Affordable Care Act. But House and Senate Republicans have so far failed to pass legislation to repeal and replace the health care law. Price has drawn criticism for his frequent travel outside of Washington during a period when health care policy was dominating the debate on Capitol Hill. 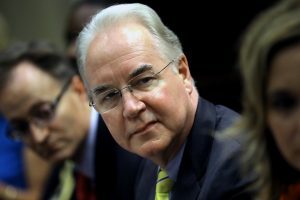 Price sparked controversy even before becoming secretary, when news reports surfaced after his nomination that Price made health care stock trades during a federal investigation into insider trading. Price was not a target of the probe, but his stock trading spurred a wave of negative press just as the Senate was getting ready to take up his nomination. Price worked as an orthopedic surgeon before entering politics. 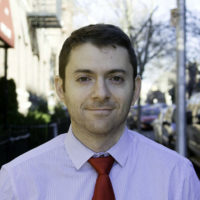 He served in the House from 2005 to 2017, rising to become chairman of the House Budget Committee. NewsHour’s Geoffrey Guray reported for this story. Left: Health and Human Services Secretary Tom Price resigned Friday. REUTERS/Carlos Barria.